I’ve heard people complain that origin stories are boring. That’s a misleading statement, though. How characters gain their powers generally isn’t all that interesting. Why they decide to use those powers to help others…that’s the interesting part. That’s when the characters are at their most dynamic. Peter Parker getting bitten by a radioactive spider is a utilitarian plot device. At best, it qualifies as an attention-getting inciting incident. But Peter deciding not to stop a thief, and that thief then murders his uncle, thereby supplying Spider-Man with motivation for all future stories? That’s the compelling part. When Stan Lee and Steve Ditko’s original story ran in Amazing Fantasy #15 back in 1962, it packed a surprising amount of depth for an eight-or-so-page comic story. In 2000-01, Brian Michael Bendis and Mark Bagley expanded it to six issues for the inaugural storyline of Ultimate Spider-Man, which gave us a modern teenage Spidey free from any continuity baggage (until the Ultimate line amassed its own messy continuity, that is, but Spider-Man had the only series that remained strong throughout). The story deserved this expanded retelling. The extra length allows us to spend more time on each significant moment, and issue #5 depicts the defining night of young Peter’s life. He’s just learned his Uncle Ben was murdered, but his recently acquired powers allow him to at least apprehend the killer. Bendis and Bagley take us from Peter’s anger, to his shock at recognizing the killer, to his anger at himself, to his guilt, to his understanding of what his uncle was always trying to teach him, and ultimately to a heartrending final page. Peter wasn’t Spider-Man in the first four issues; he is by the end of this one. 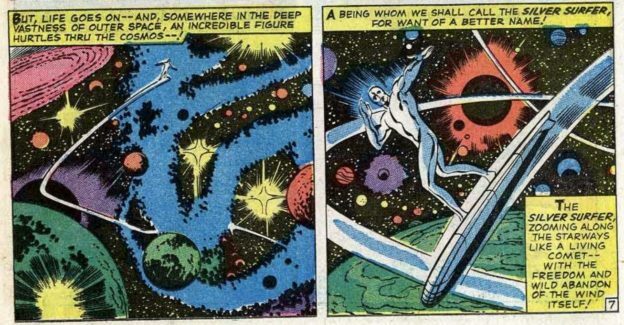 The creators utilize the extra space to such superb effect, it makes it all the more impressive that Lee and Ditko nailed the story in so few pages all those years ago. Whether told in eight pages or more than a hundred, Spider-Man’s origin story holds up as among the greatest—not because of any sci-fi spider bites, but because he learned a life-changing lesson through tragic failure. This entry was posted in comic books, Today's Super Comic and tagged Brian Michael Bendis, Mark Bagley, Marvel, Peter Parker, Spider-Man, Stan Lee, Steve Ditko, Ultimate Spider-Man on March 28, 2017 by drsherrier. The best comic book series in the 1960s was easily The Amazing Spider-Man. More than any other book at the time, Spider-Man put character first and did so without skimping on the excitement. It set the template for many teenage superheroes to follow, but at the time there wasn’t anything quite like it. Issue #11 serves as a great example of a typically solid ‘60s Spidey story, incorporating relationship drama, well-choreographed action, and a fallible hero. I first read this one as a kid in the ‘90s, about thirty years after it debuted, and I loved it. It’s not timeless, but it holds up remarkably well compared to its contemporaries. Doctor Octopus returns for (I think) only his second appearance…and who’s that picking him up as he’s released from prison? Why, it’s Betty Brant, Daily Bugle secretary and Peter Parker’s first girlfriend. How about that? Should Peter maybe reconsider his decision to tell her he’s Spider-Man? Stan Lee’s story is plenty engaging, and Steve Ditko’s layouts bring the action to life. And to spice up the typical hero/villain confrontation, Spidey sprains his ankle right before the fight starts. 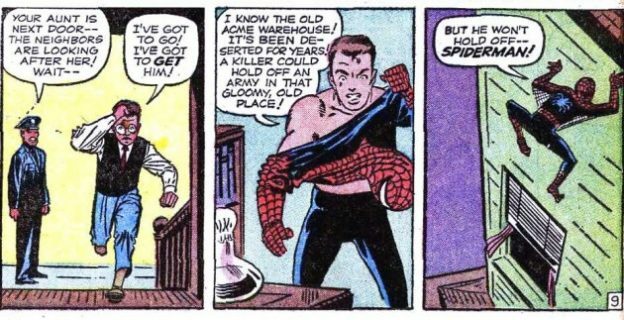 And that’s classic Spider-Man in a nutshell—he’s the guy who hurts himself before the bad guys even get the chance. This entry was posted in comic books, Today's Super Comic and tagged Amazing Spider-Man, Doctor Octopus, Marvel, Spider-Man, Stan Lee, Steve Ditko on July 1, 2016 by drsherrier.